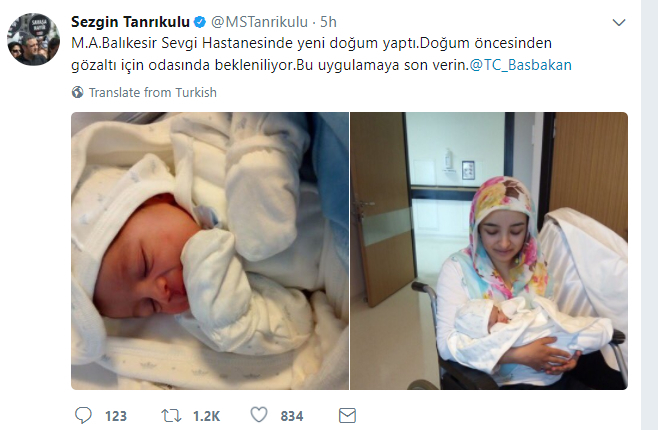 Turkish police are waiting at Balıkesir Sevgi Hospital to detain M.A., who just gave birth by cesarean section, over alleged links to Turkey’s Gülen group, which is accused by the Turkish government of mounting a botched coup attempt last summer, an opposition deputy tweeted on Saturday. Sezgin Tanrıkulu, a deputy from the main opposition Republican People’s Party (CHP) has called on Turkish authorities to stop the practice of detaining women hours after giving birth due to their alleged links to the Gülen group. This is not the first-time Turkish police were reported to wait in/outside a hospital room to detain a woman who just had a baby as hospitals, hotels as well as state institutions have become common places where suspects are required to check in for registration, involuntarily helping police to locate them. Havva Hamamcıoğlu, Nazlı Mert, Esra Demir, Aysun Aydemir, Elif Aslaner and Fadime Günay are only some of the women who also faced detention shortly after delivery as part of a post-coup witch-hunt targeting alleged members of the Gülen movement.